Canon has released two mirrorless digital camera models with built-in Wi-Fi, Canon G7X and Canon SX710. Despite both sporting a similar optical resolution and wireless connectivity, Canon G7X is available at a price point that is considerably more expensive compared to Canon SX710. So, is it Canon G7X or Canon SX710 that holds the best value for the money? Let’s see their comparisons below. Even though both Canon G7X and Canon SX710 have 20MP optical resolution, you should note that they use different image sensors. 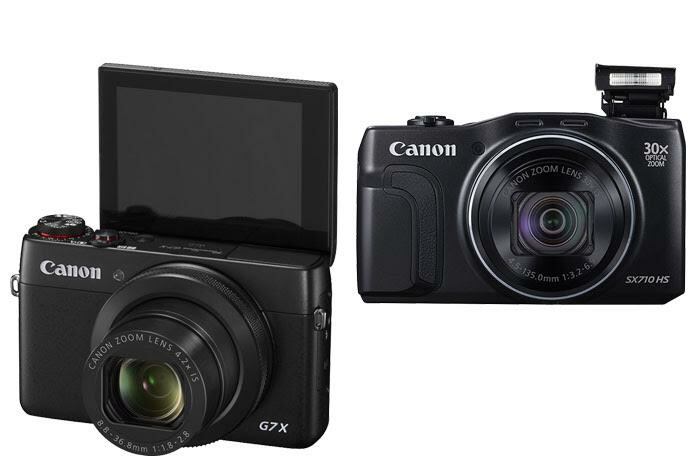 Canon G7X uses a 1.0” BSI CMOS sensor while Canon SX710 uses a 1/2.3” BSI CMOS sensor. Having a significantly wider sensor area, Canon G7X can effortlessly capture better, more accurate colors. The colors are much more vibrant and vivid. While Canon SX710 only has 3200 max ISO, Canon G7X offers heightened controllability with 12800 max ISO. It also comes with a more powerful AF system that features 31 focus points capable of tracking your photo objects precisely. In addition, it features a built-in ND filter and RAW support, too. However, the 24-100mm zoom lens is only able to perform up to 4.2X optical zoom. If magnification power is your top priority, then you should consider Canon SX710. The model boasts a very powerful 25-750mm zoom lens, offering up to 30X optical zoom. Such high zoom levels are needed when you can’t shoot your pics from a close distance, for example when documenting a football match or snapping pics of wild animals. The only way in which Canon SX710 becomes viable is if you really need the ultra-high zoom levels. Otherwise, you should go with Canon G7X, which is more feature-packed and has better image quality.